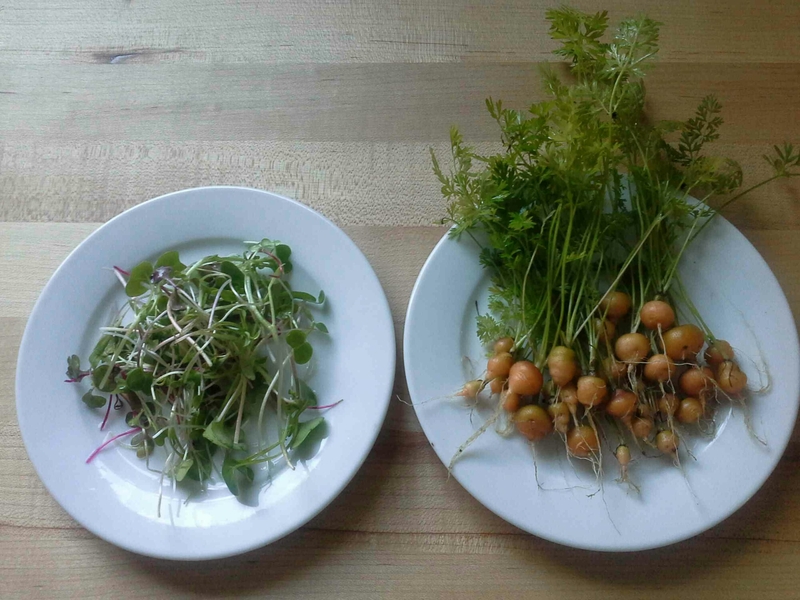 This weekend’s harvest was just a handful of mesclun sprouts and tiny round carrots that I had to pick out of my wine crate. Unfortunately the box was too shallow so I need to start again with my carrots. They are really cute though. My garden is still muddy from this week’s storm. My arugula sprouts got smooshed as did my cucamelon, which finally succumbed to the cold. Rain is forecast for tomorrow so I did what I could to clean up the garden. I am behind on my planting, so hopefully next weekend will be warmer. The good news is I have random volunteer sprouts coming up in the backyard, most likely from seeds that I dropped or from plants that I let go to flower this summer. It’ll be interesting to see what grows. Those carrots are so cute! All I get are mutations hahaha! Thanks! I get lots of wonky carrots too. They are still fun to eat. After you roast them, all the carrots look alike!